Learn about the history, challenges, setbacks, victories and hopes of the Mexican Animal Rights movement. Für das Video eines sehr ähnliches Vortrags, siehe unten. 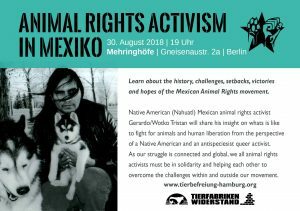 Native American (Nahuatl) Mexican animal rights acitvist Gerardo/Wotko Tristan will share his insight on what is it like to fight for animals and human liberation from the perspective of an Native American and an antispeciesist queer activist. As our struggle is connected and global, we all animal rights activists must be in solidarity and helping each other to overcome the challenges within and outside our movement. ///Tierfabriken-Widerstand tries to be aware of as many different forms of discrimination as possible – sexism, homophobia, racism, anti-semitism, classism, speciesism, lookism, to name just a few. While we are all involved in various forms of structural discrimination, we expect that attendees at this event show willingness to reflect on their own personal experiences, privileges and on different forms of discrimination and exploitation.